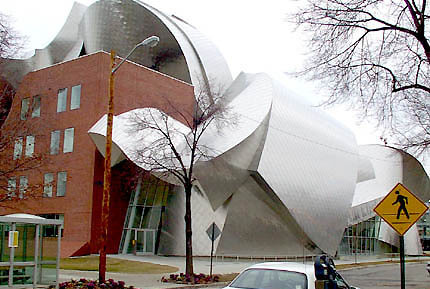 Named after Peter B. Lewis, chief executive and president of Progressive Insurance, Frank Gehry's building in the Case Western Reserve campus is a $62 million building (of which Mr. Lewis gave $37 million) with 152,000 square feet of space. 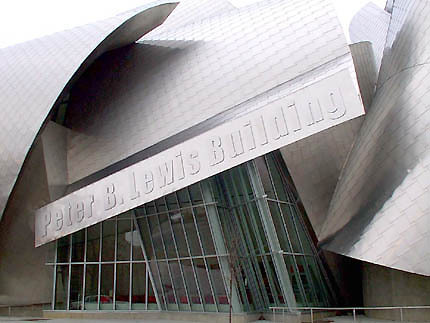 Peter B. Lewis and Frank Gehry have had a long professional and personal career dating back to Lewis' commissioning Gehry to design his home, which was never built. The long design process for the unbuilt home is credited with having helped many of the design advances that would lead to Gehry's design of the Guggenheim Museum in Bilbao. 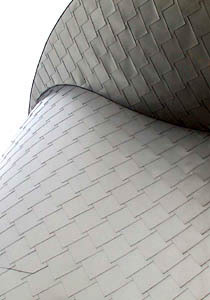 Like in Bilbao, here Gehry makes use of the undulating forms that have now become his signature. For Lewis and the school, Gehry's curves and shapes signify the manner in which management and business is taught at Case Western. Entering the building through a small door that is almost dwarfed by the large shapes above, one enters into cleanly designed interior spaces, which are somewhat reminiscent of Le Corbusier's use of curves in his later years. 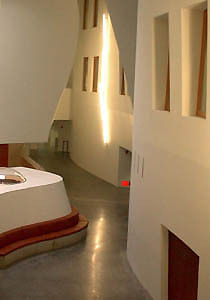 Perhaps the most successful aspect of the building's interior is the manner in which light shifts and changes hue as it bounces from high white walls. At certain times of the day, one could certainly believe that interior spaces are painted in colors other than white due to the changing hues on the higher parts of the walls. Artificial lighting is primarily brought about by simple fluorescent tubes which hang high up on walls, in a manner very much like the work of Dan Flavin. In this way, the interior of the building puts on a show that must be appreciated over time, as light shifts through the day. Other noteworthy features of the interior are the air-conditioning/heating vents, thin slits in the plaster walls that mimic the angles and repetitious nature of fluorescent bulbs arranged on the undulating walls. These too have a slight Le Corbusier feeling to them, appearing much like the thin slits allowing light into Ronchamp. 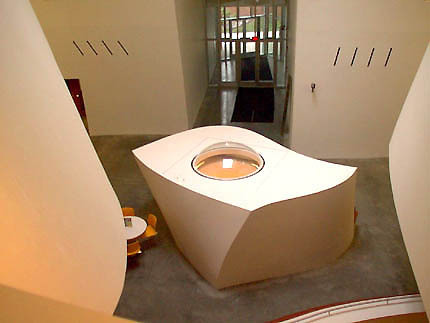 Sitting in the main atrium space is a large sculptural form, which serves as a skylight for a classroom underneath. Viewing it from high up, the oversized skylight appears to be a pushpin holding the lively building in place. While interior spaces are cleanly designed and in certain cases almost austere, the richness of materials used and the prominent use of wood warm up the space, which is probably further energized during class hours since some spaces are tight and force students to interact and acknowledge one another. Classrooms are bright, ample and laid out in a functional manner. Perhaps the only objectionable aspect of the building is the clumsy "Peter B. Lewis Building" sign that hangs near the entrance. Attached in a manner that makes it look as though it had been an afterthought, and set in Impact, the sign breaks the flow of curves that would otherwise nicely interact with windows underneath. Donating $37 million dollars, however, buys you the ability to do as you wish with your name. The Peter B. Lewis Building is located within the Case Western Reserve campus in Cleveland's University Circle. Though its mail address says it is located on Euclid Avenue, the building is actually located just off Euclid on the intersection of Ford Drive and Bellflower Road. Also of interest is the sculpture garden that sits behind the building, on Bellflower Road. It was designed by Philip Johnson and includes his sculpture "Turning Point". Street parking is available (metered and unmetered). Half-hour tours of the building are normally available (which allow visitors to see classrooms that are normally closed to the public) Saturdays and Sundays between 1pm and 3.30pm. For more information please visit www.weatherhead.cwru.edu/tour/ or call +1 216 368 2030. A virtual tour of the Peter B. Lewis building (with multiple Quicktime VRs) is available at www.weatherhead.cwru.edu/wsom/virtualtour/. You can also view a two-minute video about this building at: www.cwru.edu/pubaff/univcomm/vnr/spring01/gehry.htm.